Retirement. College. An emergency fund. A new home or home improvement project. Check, check, check, and check. If you’ve been saving faithfully each month for some or all of these things, you might feel that you’re on a never-ending financial treadmill. It takes discipline, perseverance, and sacrifice to maintain a robust savings effort month after month, all while meeting your day-to-day financial obligations. But with such planning and focus, it’s possible to get into a rut of always saving for the future with nothing left for today. If so, it might be time to take a step back and focus on the present. If you can’t remember the last time you felt energized or inspired in your daily life, consider investing in a new asset: yourself. Focusing on yourself from time to time might just give you the extra motivation you need to stick with your long-term savings plan. Think of it as seeing the trees instead of the forest for a change. Sore muscles? Chronic backache? Neck pain from working at a computer all day? Maybe it’s time to see a physical therapist and invest in an ergonomic office chair, a stand-up desk, or a new bed and pillows. Do you feel as though you’re living the same day over and over again? Doing something outside your normal routine can shake out the cobwebs and give you fresh inspiration and a new perspective. Possibilities include taking a trip to a new destination, participating in a short volunteer vacation, enrolling in an adult education class, or getting involved in a new project or hobby and seeing how much fun a creative outlet can be. You don’t have to limit yourself to one! Still sporting clothes, eyeglasses, or a hairstyle from your younger days? Carrying a worn briefcase or bag to work every day? Trying to accomplish tasks on an old laptop? Maybe it’s time to update your wardrobe and accessories. 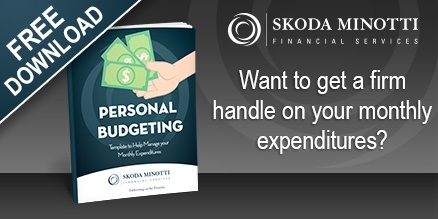 When you have many financial obligations, it’s easy to put yourself last. But occasionally, it’s important to put yourself first. In addition to the immediate benefits, investing in your health and interests might pay off in the future in the form of lower health-care costs, a wider social network of friends, fulfilling hobbies, and a new perspective on life. For more information, contact Bob Coode at recoode@smcofinancial.com or call us at 440-449-6800. This entry was posted in Financial Services. Bookmark the permalink. Follow any comments here with the RSS feed for this post. Comments are closed, but you can leave a trackback: Trackback URL.